Hi! Do you know your Bible well? 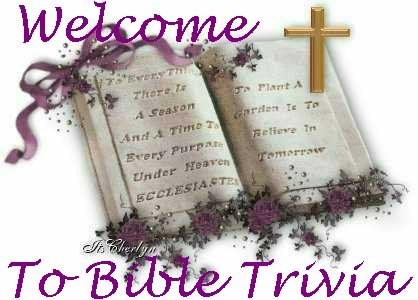 Test your knowledge with Bible trivia for kids! Not as easy as you think they are! Humorous, fun, and truthful as well. Enjoy! 1. Who wrote the first five books of the Bible? 2. The first five books of the Bible are also known as? 3. True or false: Christ was born after the Old Testament was written. 4. True or false: Most of the Old Testament was written in the Hebrew language originally. 5. Where can you find the Ten Commandments in the Old Testament? 6. Name all the Ten Commandments. 7. What happened in Genesis chapter 1? D. Creation of the heavens and the earth. 8. How many tribes were Isreal divided into in the book of Genesis? 9. Name all the tribes of Isreal. A. Moses received the law from God Himself. B. The laws was a "mosaic" because of all their differences. C. Moses was a lawyer. D. Moses threw and broke the Ten Commandments, then made up his own law. 11. Why are there so many names listed in the early Old Testament books? A. To provide ideas for baby names. B. To fill up the pages of the Bible. C. To confuse you and me with the names. D. To show the heritage of Jesus. A. teaches us about the importance and rewards of loyalty. B. is about an evil women named Ruth. C. is about Queen Ruth. D. is about a dog which barks "ruth ruth!" A. held a bachelor's contest to see who would be her husband. B. won a beauty contest, and was chosen to be the king's wife. C. was a warrior like Zena. D. was a shepherd girl, who became a prophetess. 14. True or false: The Jewish celebrate in remembrance of Queen Esther. 15. How many books are there in the Old Testament? Answers To Bible Trivia For Kids - The Old Testament. 5. B and D would be correct. You shall not make for yourself a carved image. 7. D. The creations of the heavens and the earth.8. B. 129. The 12 tribes were Dan, Asher, Naphtali, Judah, Issachar, Zebulun, Reuben, Simeon, Gad, Ephraim, Manasseh and Benjamin.10. A. Moses received the law from God Himself. 11. D. To show the heritage of Jesus. 12. A. teaches us about the importance and rewards of loyalty. 13. B. won a beauty contest, and was chosen to be the king's wife. 14. True. The Jewish celebrate the Feast of Purim in remembrance of Esther and how she saved the lives of the Jewish people. Return From Bible Trivia For Kids, To Holy Spirit Led Christian.